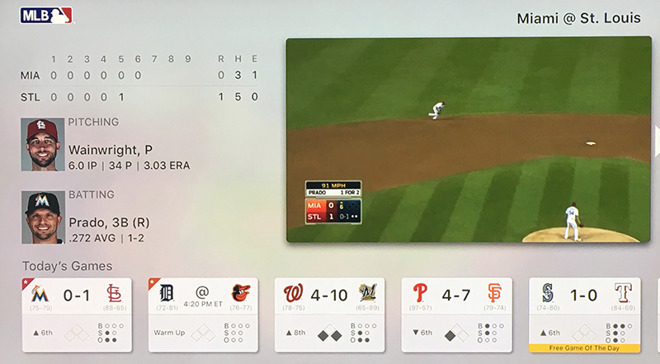 In an update sure to please baseball fans across the country, Major League Baseball Advanced Media (MLBAM) launched a long-awaited update to its At Bat tvOS app this week, debuting next-generation features like split-screen viewing, stat overlays and more. Arriving in time for the start to the regular season in April, MLB.com At Bat version 2.0 offers the truly interactive app experience promised by MLBAM when the company demoed the software at the fourth-generation Apple TV unveiling last September. Prior to this week's update, the tvOS version of At Bat was, for the most part, a port of the Apple TV channel offered on Apple's third-generation set-top. The revamped app iteration includes a host of interactive features, including a graphical user interface populated with real-time game and player stats, highlights and more. In addition, a multi-game viewing option lets fans watch two games at the same time, presented side-by-side in a two-up window view. Alongside live game coverage of out-of-market games, subscribers can access high-definition replays on demand. According to MLBAM, the app leverages a new live streaming technology for what it touts as the "best picture quality ever." During the tvOS app demo last year, the company said its app would be capable of streaming 60fps feeds on supported televisions, a key capability for smoothing out footage of fast-moving sports action. At Bat keeps fans abreast of the latest league action with interactive onscreen notifications for big plays and highlights from other games. The app also features usually seen on mobile devices, including the ability to "favorite" teams for customized in-app alerts. The MLB.com At Bat app is free to download on the tvOS App Store. Game highlights are free to watch, but live streaming and on-demand replays require an MLB.TV subscription. Offered as in-app purchases, subscriptions can range from $2.99 to $24.99, depending on coverage.